Previously called “Housing for All”, Prime Minister Narendra Modi launched Pradhan Mantri Awas Yojana (PMAY) in 2015 to provide a place to reside for millions of urban poor. The Government has already identified over 2,508 cities and towns across 26 states in the country with an aim to build over 2 million houses. MIG, LIG and EWS (Other 3 Components) – The economically weaker sections like MIG, LIG and EWS are considered as beneficiaries under the Housing for All by 2022. Middle Income Group (MIG) – annual income between Rs. 6 lakh and Rs. 18 lakh. Lower Income Group (LIG) – annual income is between Rs.3 lakh and Rs.6 lakh. Economically Weaker Section (EWS) – annual income stands at Rs. 3 lakh. Slum Dwellers – Slum areas are poorly built residences where 60 to 70 households or approximately 300 people stay. These areas are unhygienic as they lack proper sanitation facility, proper infrastructure and drinking water. People living in these people can apply for the Housing for All by 2022 Scheme under the Pradhan Mantri Awas Yojana. 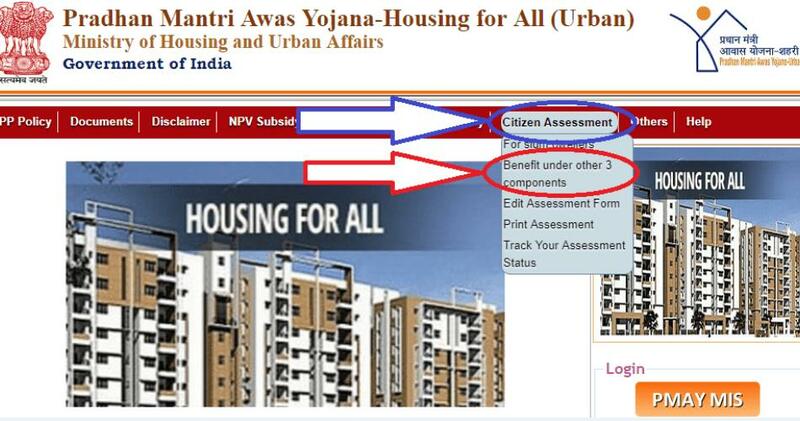 Click on “Citizen Assessment” and select “Benefit under Other 3 Components” from the options. If the information’s you provided is correct, it will direct you to the next page and you will be asked to provide information’s which include name, income, no. Of family members, residential address, contact number, age of the head of the family, religion, caste. Once all the information is provided, scroll down, type the captcha code in the box and click submit. 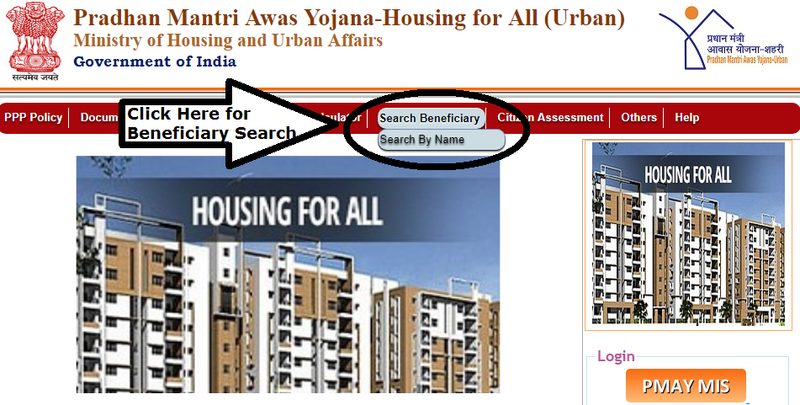 Click on the “Citizen Assessment” and select “For Slum Dwellers” from the options. Enter your Aadhaar number and click on submit. On this page, enter your Aadhaar number and select the monthly household income, check the declaration box and click “Next” for the next step. In this step, you will be asked to select a verification method, choose one from the Iris (Eye scan), Fingerprint or One Time Password (OTP). Now, check the declaration check box and click on “Generate OTP”. 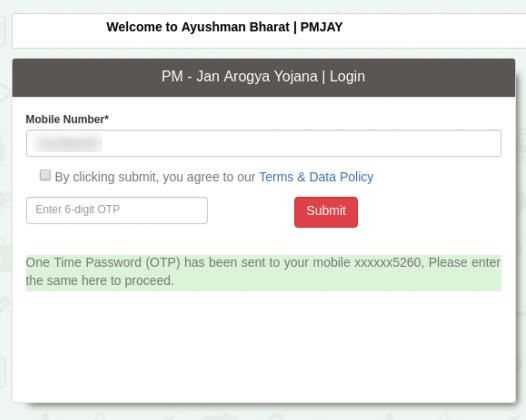 After receiving OTP on the Aadhaar registered mobile number, enter the OTP and click “Validate OTP” button. An application form will be provided on the next page. Fill the required details properly and submit it. Note: Use IE8 or Mozilla Firefox as Google Chrome or Microsoft Edge Browser are not supported. You can check the status of your application here http://pmaymis.gov.in/Track_Application_Status.aspx by entering your name, Father’s name and ID Type or by Assessment ID. आखिर आयुष्मान भारत योजना के लागू होते ही क्यों होने लगी आलोचना? योजना पर खर्च बड़ी चुनौती- आयुष्मान भारत योजना को राज्यों को साथ लिए बिना लागू नहीं की जा सकती। योजना पर होने वाले खर्च में राज्य भी भागीदार हैं। आयुष्मान में होने वाले खर्च का 60 फीसदी हिस्सा केंद्र उठाएगी, जबकि 40 फीसदी हिस्सेदारी राज्यों की होगी. जबकि, उत्तर पूर्वी और पहाड़ी राज्यों मसलन, जम्मू-कश्मीर, हिमाचल और उत्तराखंड जैसे राज्यों में केंद्र की हिस्सेदारी 90 फीसदी की होगी. PM-JAY: Prime Minister Shri Narendra Modi has launched Pradhan Mantri Jan Arogya Yojana on 23rd September 2018 in Ranchi, Jharkhand. The scheme is under Ayushman Bharat Mission which has the benefits cover of Rs. 5 lakh per family per year. PM JAY will target more than 10 crore families belonging to the poor and vulnerable population on the basis of the SECC database. SECC database is Socio-Economic and Caste Census 2011 according to which the beneficiaries of Pradhan Mantri Jan Arogya Yojana (PM JAY) will be chosen. Pradhan Mantri Jan Arogya Yojana has its several benefits for the people of the country. The details regarding the salient features of PM JAY is available below. PM JAY will have a benefit cover of Rs. 5 lakh per family per year. This will cover pre and post-hospitalization charges as well as all secondary care and most of the tertiary care procedures. There will be no restriction on family size & age and the beneficiary will receive a defined transport allowance per hospitalization as well. The beneficiary can avail the cashless benefits under PM JAY Scheme in any Public or Empanelled Private hospitals across the country and get free treatment. All the pre-existing conditions will be recovered from Day 1 of the policy. The beneficiary need not pay money for treatment in case of hospitalization. Pradhan Mantri Jan Arogya Yojana automatically covers all the family members of the eligible beneficiary as per latest SECC database. The payments for treatment will be done on the package rate in order to control costs. It will be a paperless, cashless transaction for the beneficiary. The beneficiary has to carry any Prescribed ID to receive treatment at the hospital. To avail the benefits of PM-JAY, one should fall into the category of eligible beneficiary. A person whose record is available in the SEC database is eligible for PM JAY Scheme. However, the scheme automatically covers the family members of the beneficiary irrespective of family size & age. This is a big help for the people who are not able to carry the expense of the treatments. Read the steps to check the PM JAY Eligibility from below. 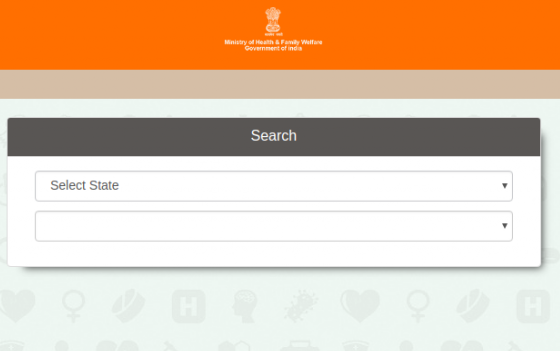 Visit the website of Pradhan Mantri Jan Arogya Yojana that is www.abnhpm.gov.in. Then click on the button and a new window will open asking for Mobile Number and OTP. 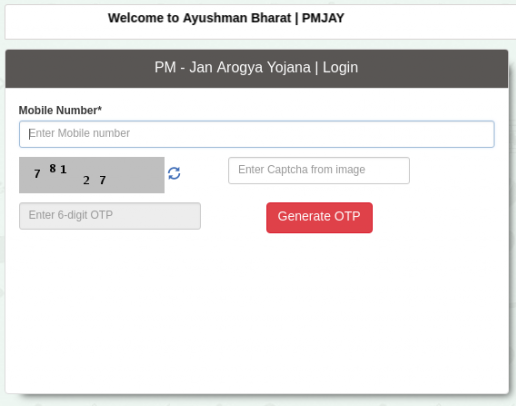 After that fill your Mobile Number, Captcha Code & click on ‘Generate OTP’. Hence fill the OTP in the given space, select on the checkbox to accept the conditions & click on the ‘submit’ button. After that, a Search window will open wherein one can find his/her detail. 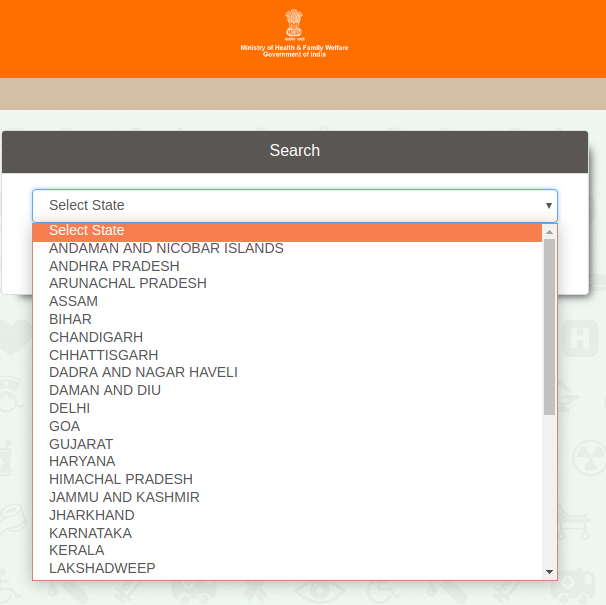 Then select the state where you are residing from the drop-down menu. Further, choose the category from the available options in the drop-down. 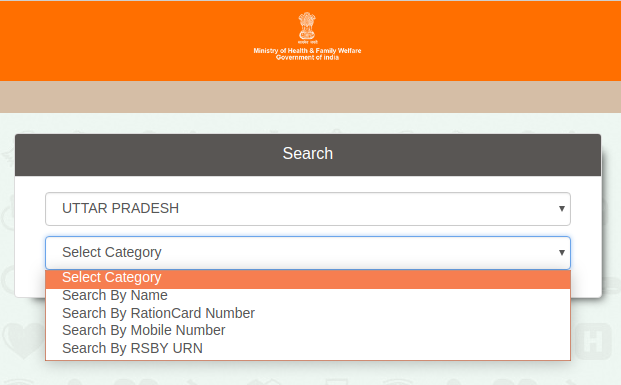 You can search your details by choosing the category such as Name, Ration Card Number, Mobile Number, RSBY URN & can check your eligibility. Pradhan Mantri Jan Arogya Yojana scheme will target 10.74 crores (approximately 50 crore beneficiaries) rural families and identified an occupational category of urban workers families depending the latest Socio-Economic Caste Census (SECC) data covering both rural and urban. Ayushman Bharat -National Health Protection Mission (AB-NHPM) will cover all districts of all the States/UTs in order to provide the benefit to the person in need. All such enrolled families under Rashtriya Swasthaya Bima Yojana (RSBY) that do not feature in the targeted groups as per SECC data will be included as well. Households with non-agricultural enterprises registered with the government. A Household member is a government employee. Households having Kisan Credit Card with the credit limit above Rs. 50,000/. Households having mechanized 3/4 wheeler agricultural equipment. Households having motorized 2/3/4 wheeler/fishing boat. Total deprived Households targeted for PMRSSM who belong to one of the six deprivation criteria amongst D1, D2, D3, D4, D5, and D7. Only one room with Kucha walls and Kucha roof (D1). No adult member between age 16 to 59 (D2). Female-headed households with no adult male member between age 16 to 59 (D3). Disabled member and no able-bodied adult member (D4). Landless households deriving a major part of their income from manual casual labor (D7). Electrician/ Mechanic/ Assembler/ Repair worker. Shop worker/ Assistant/ Peon in small establishment/ Helper/Delivery assistant / Attendant/ Waiter. Transport worker/ Driver/ Conductor/ Helper to drivers and conductors/ Cart puller/ Rickshaw puller. Home-based worker/ Artisan/ Handicrafts worker / Tailor. Construction worker/ Plumber/ Mason/ Labour/ Painter/ Welder/ Security guard. In this article, we provide information about Pradhan Mantri Awas Yojna Eligibility. 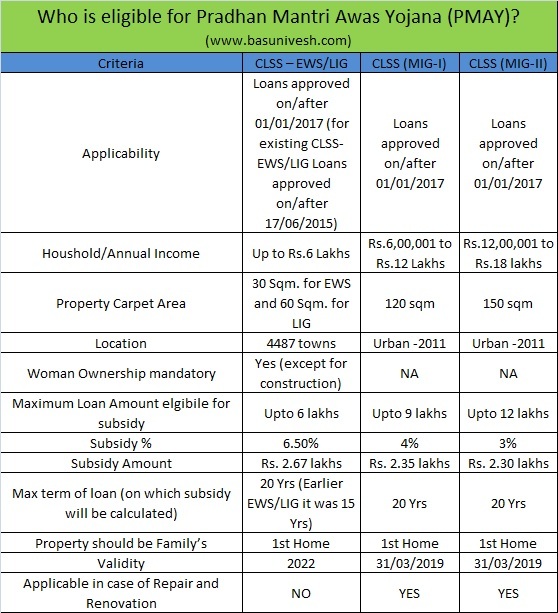 Pradhan Mantri Awas Yojana is a Government initiative with the aim of “Housing for All 2022”, launched on 25th June 2015 by the Honourable Prime Minister Shri Narendra Modi. PMAY is an effort to provide homes to the needy. Despite having made massive leaps in development over the last decade or so, India still has a large number of people living in abject poverty, most of whom don’t have a house to call their own. The Indian government took up a serious step towards abolishing homelessness with the introduction of Pradhan Mantri Awas Yojana. This project, which was previously known as Housing For All, will provide a roof to over 20 million urban poor people by the year 2022. In order to do so, the Ministry of Housing and Urban Poverty Alleviation has set a route map and has also made clear the eligibility criteria a prospective applicant need to meet. Economically Weaker Section (EWS) People who earn an annual household income less than Rs.3 lakh come under the EWS category. However, an applicant claiming to be from EWS needs to provide relevant proof to the government to ascertain their claims. Light Income Group (LIG) People that fall under LIG category usually have an annual household income ranging from Rs.3 lakh to 6 lakh. Again, to be eligible for consideration, they need to provide sufficient proof of their economic standing. Medium Income Group (MIG1) Those who earn an annual household income below Rs.12 lakh fall under the MIG1 category. These people can avail loans of up to Rs.9 lakh for the construction of a residence. Medium Income Group (MIG2) Individuals earning an annual household income between Rs.12 to Rs.18 lakh will fall under MIG2 of the PMAY scheme. These people can avail loans of up to Rs.12 lakh. Minorities People hailing from minority groups like SC/ST/OBC will fall under minorities. To be considered under the PMAY scheme, these people need to meet to provide relevant caste and income certificates. Women belonging to EWS/LIG categories will be considered if they apply under the PMAY scheme. Currently, there are three schemes under which you can apply for Pradhan Mantri Awas Yojana (PMAY). They are as below. The Ministry of Housing and Urban Poverty Alleviation has enlisted the help of some leading banks in the country to provide loans for construction under PMAY. The banks offer loans at a comparatively lower rate as the government pays the rest on behalf of the applicant. This model of subsidized loans helps more economically weaker people to build a house. The applicant’s family must not own a house in any part of the country. In the case of a married couple, either a single or a joint ownership deal is allowed, and both options will receive just one subsidy. The applicant’s family must not have availed the benefit of any housing-related schemes set up by the Government of India.